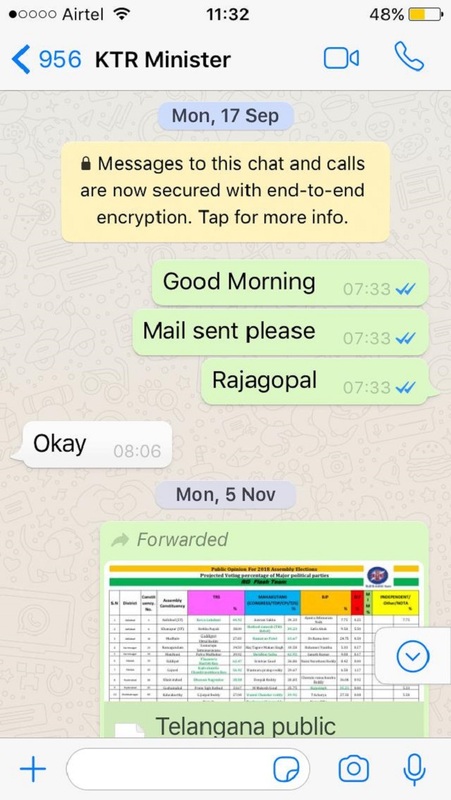 Former Congress leader Rajagopal accused Telangana IT Minister KTR of hurting his reputation and both of them have shared screenshots from their WhatsApp conversation with the media. Lagadapati Rajagopal, the former Congress leader and former MP hit out at Telangana IT Minister and TRS supremo K Chandrasekhar Rao’s son K T Rama Rao, stating that he had hurt his reputation and posted the WhatsApp conversation he had with KTR on Twitter. He added that the full conversation along with the context is on his phone. The former Congress leader and former MP had triggered a controversy in the state after he announced preliminary results from his pre-poll survey. It was during his visit to Tirumala on December 1, Rajagopal told the media that a good number of independents will win in the upcoming polls, as opposed to candidates from major parties. On Tuesday, Lagadapati Rajagopal said that the Congress-led People’s Front would secure the majority in the upcoming Assembly Elections if the polling percentage crosses 68%. Furthermore, he said that a hung Assembly is also possible if the voting percentage drops. 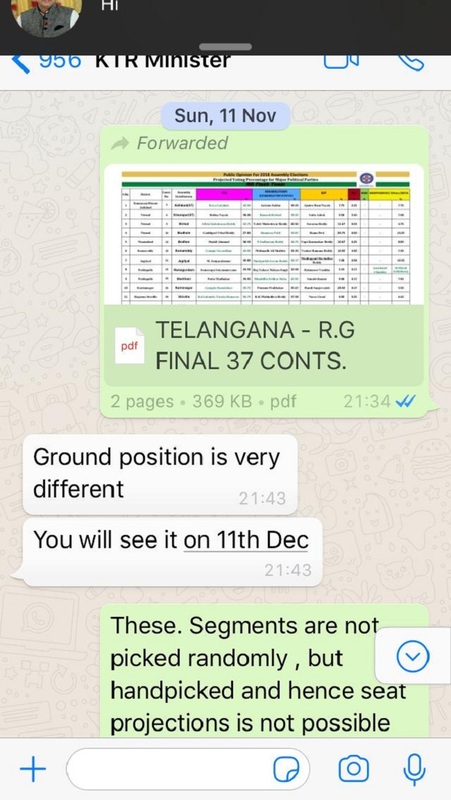 After this, IT Minister and KCR’s son KT Rama Rao tweeted a screenshot of a conversation allegedly between him and Rajagopal and said that the survey was “concocted”, and that the same survey was shared with him, which said that the TRS would win 65-70 seats. Addressing the media on Wednesday, Rajagopal said that KTR met him on September 16-17, and asked him what the situation is as word got out that the they were conducting a survey. “He asked us what the situation was like. I said that I don't have the results but my media team did. On September 17, I sent him mail of the report,” Rajagopal said. He went on to say that that it was in TRS’ favour between August 20 and September 12, prior to the Assembly’s dissolution in October and the formation of the People’s Front. Furthermore, he added that KTR had initially sought to know what TRS’ chances were in 23 constituencies and then on November 11 had asked how the ruling party would fare in 37 constituencies. Holding his phone up, Rajagopal said that a majority of them were Congress winners. “He replied saying ground reality is different. You will see it on December 11. He didn't believe the report,” Rajagopal said. He went on to add that that’s when he sent KTR the message, whose screenshot is on Twitter. “From November 11 to November 20, seat distribution started in the Prajakutami. Then, people started losing confidence because of infighting. On November 20, I sent him a message saying that they will win 65-70 seats,” he said. “I have since got many reports since November 20. I didn't share any of those. In Tirupati, I casually said I won’t talk about parties but said my prediction for independents,” he added. He made one more prediction at the press meet on Wednesday, and said that Warangal may lean towards the Congress. He said that he was making this prediction because land was not given to Dalits, members of Scheduled Tribe communities didn’t get the reservation they were promised, the two-bedroom housing scheme was implemented fully, and a Dalit was not made the Chief Minister. “Two pensions to each house and loan waivers are helping Congress. There is an undercurrent. Minorities are also not satisfied that 12% was not given,” he said. “I never met KTR in 5 years except on that date mentioned when we met at a close friends house,” he stated.